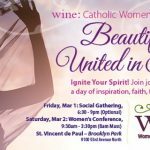 Ladies, join WINE: Women In the New Evangelization as we welcome a gripping storyteller, author, and art historian from Rome who weaves together faith and reason and shares her passion for the beauty found in the paintings, architecture, history, and people of the Eternal City. A woman of many talents, Liz Lev is an American-born art historian with the good fortune to live and work in Rome, and you’d be hard-pressed to find someone who knows more about the nuances of this awe-inspiring and vibrant city. So, join us on Tuesday, December 4th for Women, Wine & Wisdom, the Catholic Woman’s “Theology on Tap,” as fabulous Catholic speaker, Liz Lev takes us on an empowering journey through Rome and her history. The evening will include a generous buffet of appetizers, and of course, we WILL have chocolate! WINE, chocolate, humor, and inspiration—the perfect recipe for a fantastic faith-filled night! So, invite some friends and come for a fun and faith-filled evening. Space is limited, so sign up early!